The people of the Republic of Somaliland reasserted their independence at a Grand Conference of the Somaliland Communities on 16th May 1991. 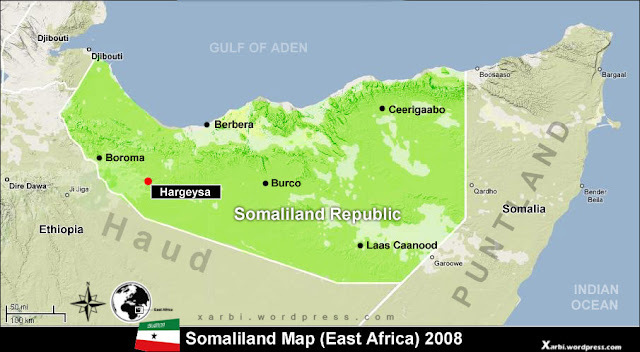 For the people of Somaliland, this marked the end of the union of the State of Somaliland (the former British Somaliland Protectorate), which became an independent state on 26 June 1960, and Somalia (the former Italian colony and trusteeship territory), which became independent on 1 July 1960. The Conference, besides endorsing the declaration of independence, resolved that an interim government headed by a President and led by the Somali National Movement (SNM), should be built and should hold office for a period of two years. Then Chairman of the SNM, Mr. Abdirahman Ahmed Ali (Tuur) was endorsed as President and Mr. Hassan Essa Jama as Vice-President by both the SNM Central Committee and the Conference. Putting behind them the long period of dictatorship and near-genocidal war of the 1980s, the Somaliland people than started concentrating on their efforts of building peace through grassroots initiatives which started even before the May 1991 Grand Conference, and then moved on to rebuilding state institutions. Borama Conference on 1993 was finally settled and constitution was agreed by all Somaliland communities from Sool to Awdal regions. This conference established political consensus and power-sharing arrangements that provided the foundations for new state structures. There was also a strong desire, as later expressed strongly in the preamble to the new Somaliland Constitution, to break away from the past injustices and tyranny. Somaliland independence is public decision and neither Vice President nor President or any other political party can hijack the public into another dark unity with Italian Somalia. On 18th May 1991, the people of Somaliland primarily decided to recreate the lost nation of Republic of Somaliland and during 2001 Referendum; they reassured to the world that Somaliland independence is public but not political. The recent speech of Somaliland Vice President Ahmed Yasin was misread by the opposition parties in Somaliland for political gains, the Vice President meant that Somaliland government will not impose restrictions on business, trade and immigration between Somaliland and Somalia. But there is no way, that Yasin can consider uniting the failed Somalia again. The recent statement of Somaliland Vice President Ahmed Yasin, say "Somali speaking people need each other" was misinterpreted by media and politicians, to achieve political gains in this hot political season where the presidential election is in less than two months – 29th March 2009. Somalia websites circulated the speech along with Somaliland opposition parties, for political again in the upcoming elections against the ruling party UDUB. This is signs of healthy democracy, where free competition is the backbone of all time. UCID and Kulmiye opposition parties, criticized the statement and demanded the resignation of the Vice President Ahmed Yasin, and asked the President of Somaliland Dahir Riyale to disown the statement of his deputy. Somaliland had history of stamping out politicians who call for unity with Italian Somalia. In 1993, former President of Somaliland and Former Chairman of Somali National Movement (SNM) Abdurrahman Ahmed Ali joined federal Somalia government led by General Mohamed Farah Aideed, and later he was deported from Somaliland. Former Ministers of Somaliland like Ismail Buubaa and Jamac Yare have no access to Somaliland cities. Every person who wants to join these illegitimate leaders in Mogadishu should pack up his belongings before the decision, else will rest in Prison like Tuur. The current stability, economic development and excellent education system in the country is result of public demands, who worked hard with the government to achieve what Somaliland is today. Every tribe laid down their weapons for the sake of creating stable and strong Somaliland, and supported late former president Mohamed I. Egal. The Vice President Yasin corrected his statement, and accused the media for misinterpreting him.